I have a confession…I have a terrible black thumb. It’s truly terrible. So much so, that I often apologize to plants in my head before I buy them because I know they face a certain death due to my neglect. I can’t stop myself from buying them, they’re so pretty, but it’s always with a twinge of guilt. It seems so simple, sun and water. Very basic, very easy, but for some reason the water step seems to slip through the cracks. My outside plants have a better chance if Mother Nature is on their side. My inside plants are doomed from day one. This year’s victims were herbs I picked up at Aldi. 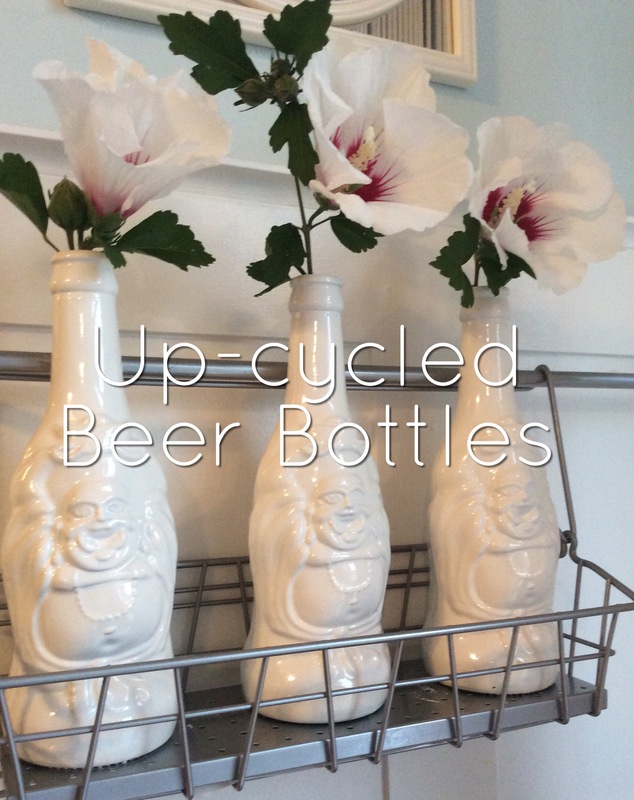 They were inexpensive and fit perfectly into the IKEA baskets I have mounted in the kitchen. I dreamt of cutting fresh herbs for our daily meals. How hard could it be to keep these alive? The baskets are hung right next to the sliding door in the kitchen, so sun is available all day. I’m in the kitchen every day, so I’ll be able to water, right? Wrong, so wrong. I could easily blame their pitiful state on our extended family vacation, but if I’m being honest with myself, these poor herbs looked just like this the day we left. Pathetic. But on the bright side, I’m keeping a husband, three kids and a dog alive…so still ahead of the game! 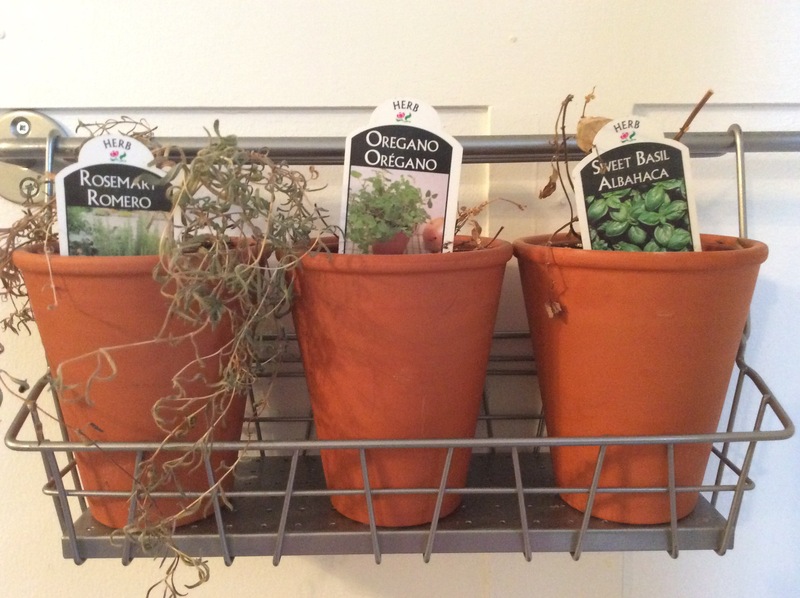 I continued to keep my poor herbs around while I tried to think of something to decorate the baskets with. I wasn’t sure if I was going to try to reuse the pots and plant something heartier, like mint. I’m not a fan of mint in my food, but I love it in drinks. Maybe that would be more inspiration to keep it alive! As I hemmed and hawed over what to do with that space I was hit with a bolt of inspiration today as we celebrated my father’s 69th birthday. What do you get a man who wants nothing, has a house full of everything, and gives away everything you give him? Beer! It’s something he enjoys and would make his special day even more enjoyable! We found this beer at Target. I know nothing about beer, and in this case, the bottle definitely sold the booze. What adorable packaging, how could I not buy it? Once my dad was done enjoying his birthday presents I was reluctant to chuck them into the recycling bin. 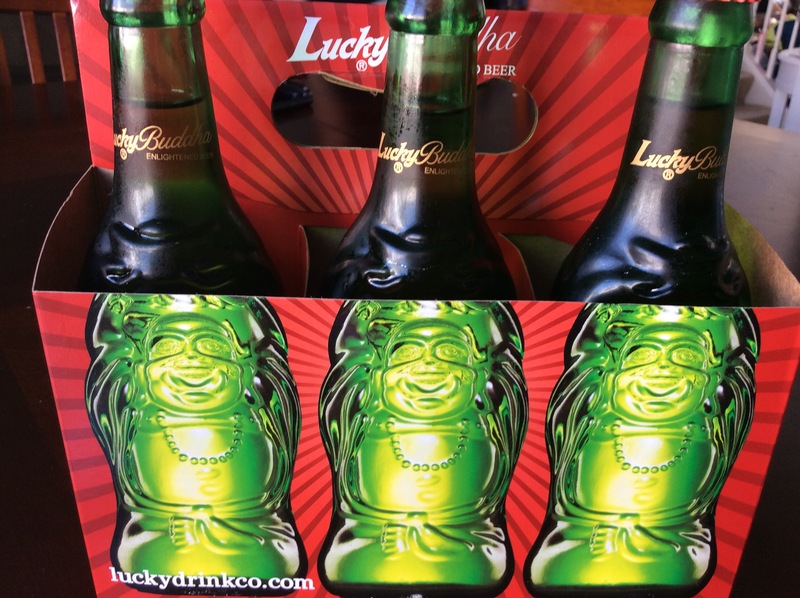 I bought the beer because the bottles were so cute, even though they were empty they were still cute. Luckily, they fit perfectly into my IKEA baskets! It was fate. 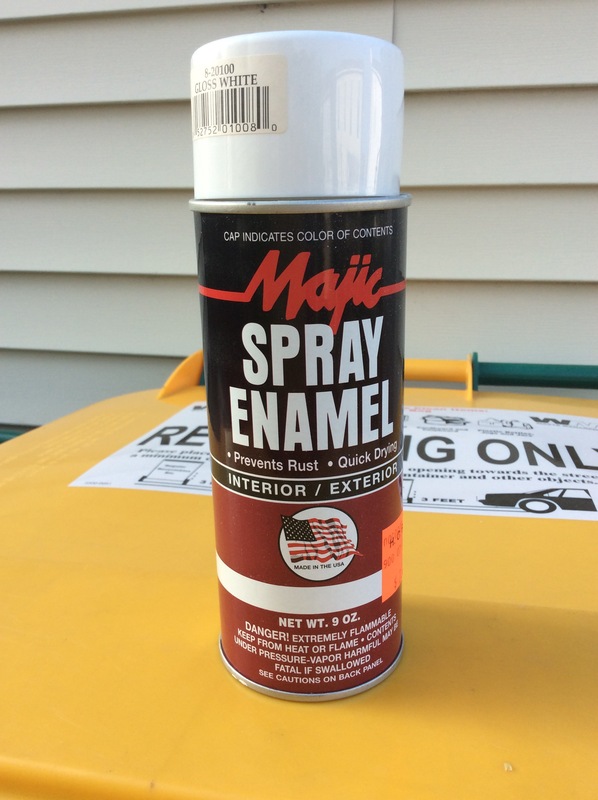 I happened to have a partially full can of high gloss white spray enamel in my garage. No time like the present to make new decorations. 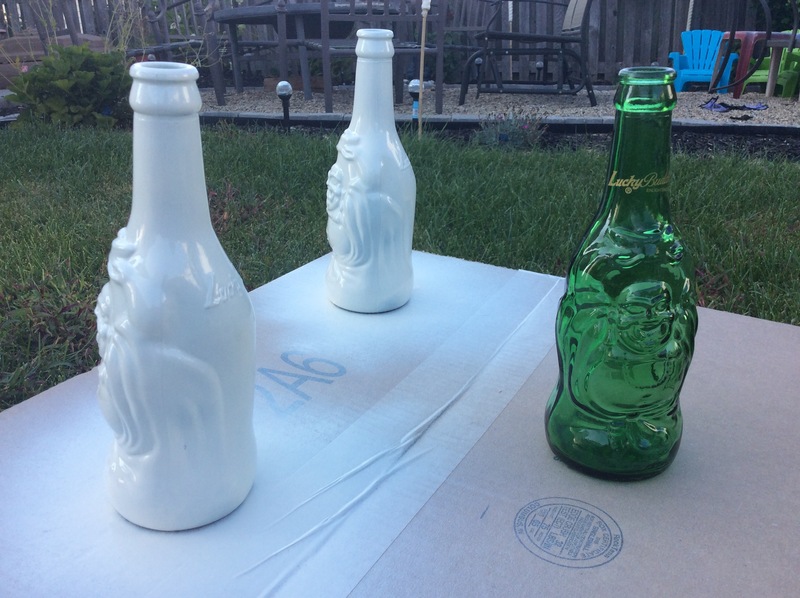 I grabbed a box from the garage, flipped it over and started spraying my freshly washed and dried bottles. Now, I have to say, I was a little impatient to get started, and didn’t thoroughly dry the bottles. I could tell once I started spraying. The paint pooled where the water was. I just wiped it out with a paper towel and continued to spray. I’ve seen people say that they’ve used rubbing alcohol and primer on glass to ensure dryness and make it last. I did neither of those things, and am really going with the fingers crossed method. I figure the bottles won’t be handled much, so hopefully they’ll keep their finish for a long time. I’ll let you know how they hold up. And here we are with the finished product! I brought them in after 40 minutes to finish curing because it’s supposed to rain out here soon. The only flowers I had available to display were from my rose of Sharon bushes that I got from my lovely sister-in-law. They’ve really done well despite my black thumb, so if you’re looking for a hearty flowering plant that can survive harsh winters and major neglect, ask Chrissie for some saplings. The blooms only last a day, but they are prolific and flower for a long time. 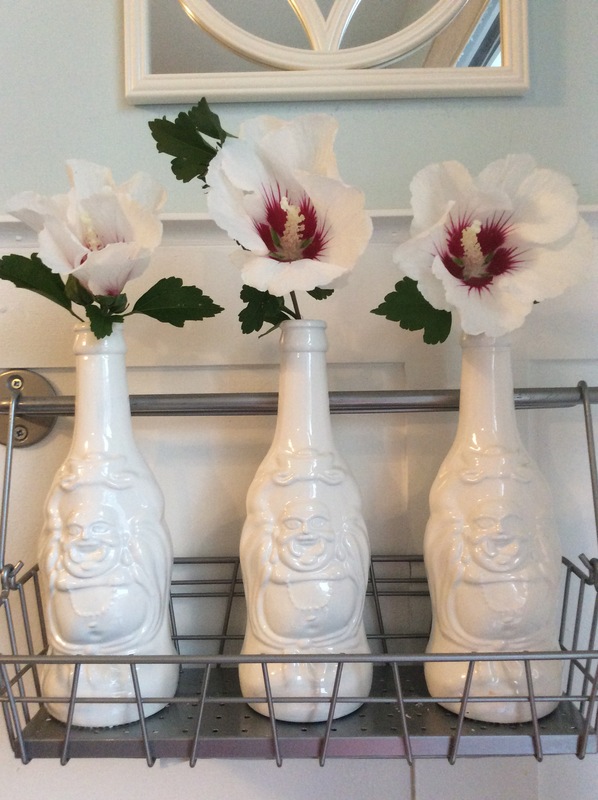 I’ll start looking for some cute fake daisies or something to finish these bud vases off with. I love how shiny they are, and the white really makes the design pop. Not bad for about $1 a beer. It’s the gift that keeps on giving, just like my dad!